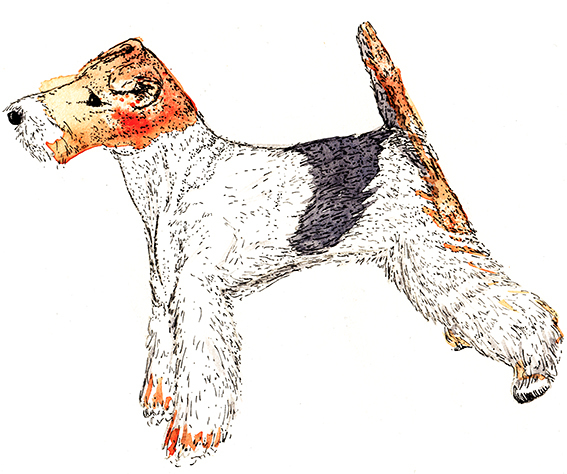 My drawing of the week is of a dog – a lovely fox terrier. I drew this by accident. I was actually going to draw a fox (and I will next week) but I came across this breed of dog while image researching and remembered how much I like them. So I thought I may as well draw this little fella. Wire fox terriers (as seen here in my watercolour and ink illustration) are known for their energy and intelligence. They have a low boredom threshold (like me and Dr B) and require stimulation, exercise (I should do more of that) and attention (we all need that). They are bred to be independent thinkers (I really like that). Now, all that remains is for me to try and persuade Dr B that we need one as a pet in our lives.